← Is a pet snake right for you? Only 4 families of venomous snakes exist in the United States. These are the rattlesnakes, Copperheads, Water Moccasins (Cotton Mouths), and the Coral snakes. For the purpose of this article, we will concentrate on Coral Snakes and some of their similar looking, yet harmless relatives. You’ve probably heard some variation of the old saying “Red next to yellow kills a fellow. Red next to black is a friend to Jack”. If only Jack was compelled to return the favor once in a while, we would have a lot less hacked-up serpents. However, the phrase is intended to be a quick rhyme to help folks identify if a snake is venomous or harmless, and for the “most part” it works in the United States. There are however, a few exceptions to the rule, which we will address toward the end. Our intention with this article, is to help people be able to better identify snakes they see in the wild, and to know which ones to avoid, and those that should be appreciated, and then left to go on their way. Many would agree, and the pet industry would support the thought, that tri-color (banded with three colors) snakes are amongst the most beautiful serpents in our country. Their colors can be so vibrant as to almost seem jewel-like. These snakes, taking the exact opposite approach to their camouflage-expert cousins, would seem more at home in a candy store, than in their native habitat. These ultra-bright colors, however, are one of nature’s ways of saying, “Stay Away”! Of course we know that Coral snakes have the fangs and venom to back up that statement, but what of the so-called mimics? There is still much debate regarding “mimics” and the benefits of being brightly colored, but the most common assumption, is that these critters are copy-cats, hoping to avoid predation by assuming the color pattern of their notoriously toxic cousins. There are only three types of Coral Snake in the United States and they all look quite similar (to the lay person), while being somewhat easily identifiable. Perhaps one of the best ways to know if you might run into a Coral snake, is by knowing where they live. The map below shows the natural range of our native Coral snakes. If you don’t live within one of the highlighted areas, you can rest assured that you won’t run into one of these critters in your back yard. 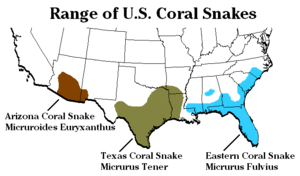 The three “culprits” as indicated on this map, are the Eastern Coral, the Texas Coral and the Arizona Coral snakes. Coral snakes belong to the infamous Elapid family, which is home to snakes like Cobras, Mambas and Sea Snakes. Elapid venom is drop-for-drop, the most toxic of all snake venoms. It is predominately neurotoxic meaning that it attacks the nervous system and will typically kill its victims by paralyzing the breathing muscles, resulting in asphyxiation. 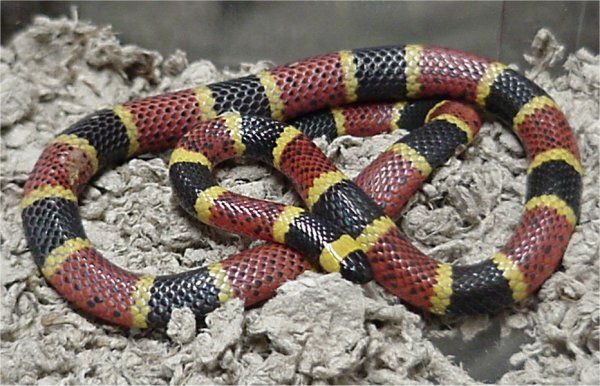 Unfortunately, there are at least a couple of very common myths about Coral snake bites that we want to address. You may have heard that Coral snakes have very small mouths, and can only bite you on the webbing between your fingers. This is absolutely not true. If you pick up one of these snakes, it will potentially bite any part of your body within reach. Another common myth that needs to go away, is that Coral snakes are “rear-fanged” with tiny teeth, requiring them to “chew” on you to inject any venom. Not only are Coral snake fangs located in the front of their mouths, as is the case with all Elapids, but they do not have to chew on you to inject venom. Although their fangs are small, they are long enough to break the skin, which allows their venom to enter your blood stream. While on the unfortunate topic of bites, it should be noted, that Coral snake bites are often no more painful than the bite of a harmless snake, but please don’t let that fool you into thinking that you escaped envenomation. There are quite a few cases in which symptoms of envenomation have not presented themselves immediately. It is therefore extremely important that you treat any potential Coral snake bite as an emergency, and seek immediate medical attention. As scary as that sounds, these snakes should be respected, not feared. Our native Corals are relatively small, shy and reclusive. They are fossorial, spending most of their time underground or under cover, and will avoid human contact at all costs. Although these snakes have the potential to deliver a lethal bite, they have smaller fangs and a fairly poor delivery system compared to the pit vipers that inhabit our country. Contrary to many beliefs, Coral snakes are never aggressive, and will only bite a person when threatened. Though a few legitimate accidents have occurred, these bites happen almost exclusively when the snakes are harassed and picked up. Despite these facts, Coral Snakes are obviously best left alone. If you are lucky enough to see one in the wild, you should appreciate its beauty from a distance, and as long as it is not remarkably close to urbanization, allow it to continue on its way. Statistics have proven that you put yourself at significantly greater risk of being bitten, if you try to catch or kill the snake, than if you simply let it crawl away. If you find a snake that absolutely needs to be removed, please call a professional in your area. Though there are some exceptions, Coral snakes are best identified by pattern. They have a solid black face, followed by a broad yellow stripe. *The red, yellow, and black bands go all the way around the body, as opposed to King and Milk snakes, which have banding that stops when it reaches the belly scales. As the saying goes, Corals also have red bands surrounded on both sides by yellow bands. As burrowers, Coral snakes have very small eyes that are solid black and hard to discern from a distance greater than a few feet. Here are examples of the three Coral snakes species that inhabit the United States. *One notable exception to the “rule” of bands stopping at the belly scales on King and Milk snakes, is the Scarlet King Snake, which does have bands that go all the way around the belly. Thanks to Margaret Nall for bringing this to our attention. This is one of our all-time favorite snake in the United States. They simply don’t get any more beautiful than this! We photographed this specimen in Southern Arizona in 2010. Although it was very flighty, it endured being photographed well and was not at all inclined to bite. You will notice that the “yellow” bands on this Arizona Coral are more of a cream color, as opposed to a bright yellow, which is common in this species. A human fatality has never been attributed to an Arizona Coral snake bite. They are considered the least medically significant of coral snake bites in our country. An interesting side note is that this handsome species has a very specialized diet. This snake is ophiophagus, meaning that it eats other snakes almost exclusively! One very unique characteristic of this specific serpent, is a defensive mechanism. When threatened or handled, the Arizona Coral snake “farts”! This rare behavior in the snake kingdom is called cloacal popping. It does not actually emit gas, but everts the lining of its cloaca, making a popping sound in hopes to attract the attention of its predator toward its tail, and away from its fragile head. Though just as beautiful, the Eastern Coral snake is not usually as vividly or cleanly colored as the Arizona species. They are however, the most toxic of the U.S. Corals. 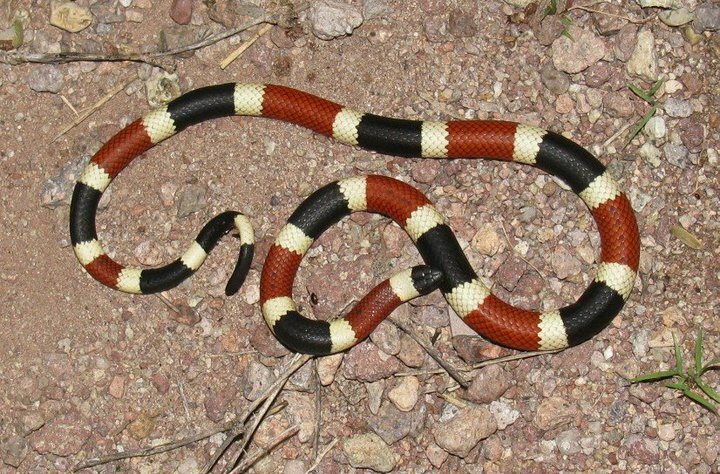 The color sequence (other than the black band just behind the head) is identical to the Arizona Coral, but their banding is often interrupted by black speckling (pitting) on their yellow and red scales, making them look a bit darker overall. These snakes eat frogs, lizards and other small snakes. As with all U.S. snakes, humans are not on their menu, and they will therefore only bite a person if disturbed or handled. 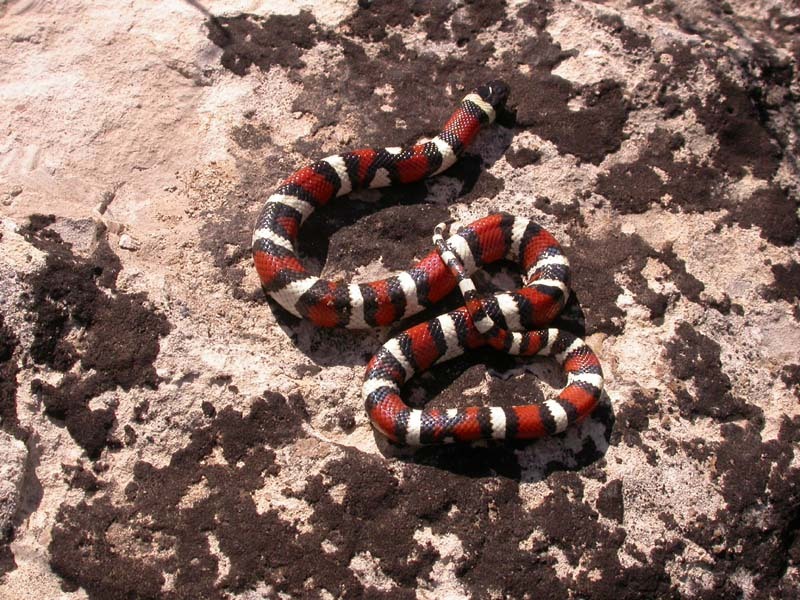 Though the Eastern Coral snake is responsible for a handful of bites each year, these bites have only resulted in two fatalities prior to the creation of antivenin in the 1960’s. Since antivenin for this species has been available there has been only one recorded death attributed to this snake, back in 2009. The victim however, failed to seek any medical treatment for the bite, and died several hours after being bitten. The Texas Coral Snake is very closely related to the Eastern Coral and up until recently was considered the same species. As such close relatives, they have very similar behavior and looks. One very notable fact to consider when dealing with any U.S. Coral snake, is that production of Coral Snake antivenin (Coralmyn) was stopped and the remaining stock of this antivenom expired in 2010. Ongoing tests have since lead to several extensions on the expiration date, but medical facilities in Florida have recently announced that they have very few vials of the serum left. 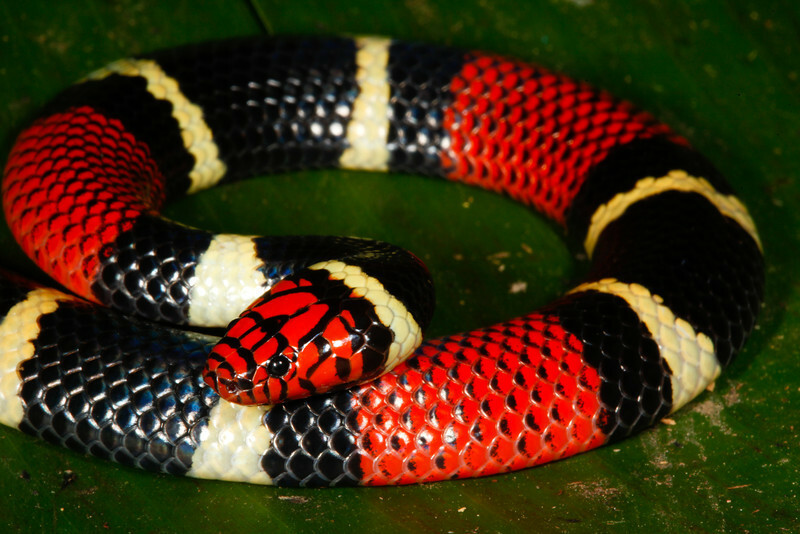 Because there are so few Coral snake bites, the serum was deemed too expensive to produce, which adds to the risk of new bite victims. There is an effective antivenom available from South America, but so far the FDA refuses to allow it to be imported. In July of 2015, it was reported that the U.S. is looking into a new Coral snake antivenin. As previously stated, not all red, yellow (cream or even white) and black snakes are dangerous. Most of them are completely harmless and are even readily available in the pet trade. Though over-collection, urbanization and the senseless killing of these animals by snake-hating zealots makes them harder to find these days, you still may strike it lucky and get to see one of these amazing creatures in the wild. The inherent “rarity” of these snakes makes many of them illegal to kill, catch or collect without a license issued by the state in which they are found. Therefore, it is still best to observe these harmless critters in their natural environment, snap some photos and let them go. 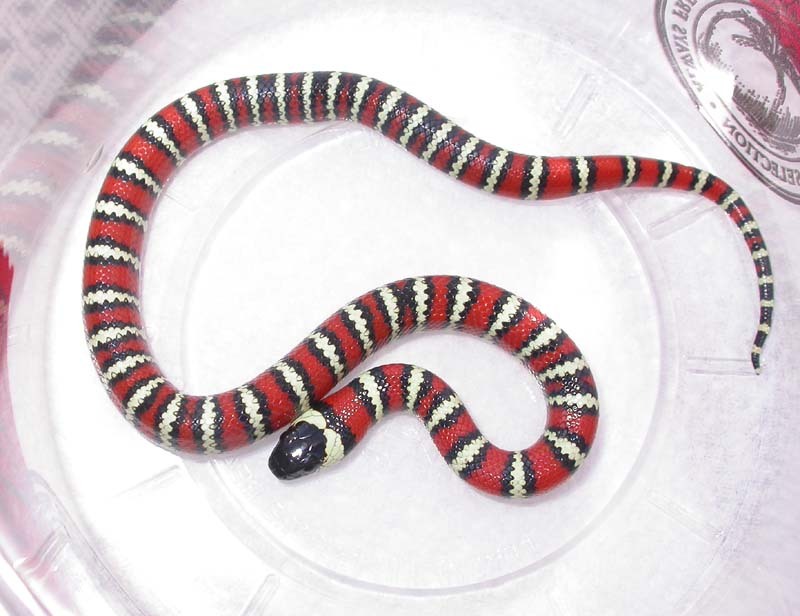 The Scarlet Kingsnake lives alongside the Eastern Coral and is one of the most commonly confused “look-a-likes”. You will however, notice that the red bands touch black and that the head is red instead of black. There are several different varieties of Milk snakes around the country, and most of them look fairly similar. You’ll notice that like the Coral Snake, the Milk snake does have a black head, but true to the saying, the red bands are surrounded by black. Grey-bands are native to Texas and New Mexico. Although they are tri-colored, they have gray stripes instead of white or yellow. These great looking snakes have a solid black head as well, and are often confused with the venomous Coral Snake, but don’t range anywhere close to Corals and again, have red bands surrounded by black. Hopefully by now, you are starting to get the idea that most of these harmless critters don’t look too much like their venomous cousins. The uneducated person might easily make the mistake, but just a little bit of research goes a long way. As mentioned at the beginning of this article, this common saying that people use to identify a harmless snake from a Coral snake, is not foolproof. Because of this, many snake enthusiasts and herpetologists would like to eliminate the saying, and often condemn those who still use it. However, since this identification aid is already out there and widely accepted by the general public, we feel that we should address it comprehensively, and help educate all those who are seeking to inform themselves. First of all, we want to emphasize that this “red touches yellow rule” does NOT apply to many of the Coral Snake species outside of the U.S. If you venture South of the border, please don’t take this saying with you, as it could land you in a heap of trouble. We have seen multiple photos of people casually free-handling Coral snakes in South America, because “red was touching black!” Below, is a photo of an Aquatic Coral Snake from the Peruvian Amazon, taken by our good friend, Matt Cage. As you can see, Coral snakes from other countries do not follow the same rules as our native ones. Next, please note that Mother Nature has a sneaky way of occasionally producing oddballs. In the herpetology community, we call these exceptions, “abberancies”. You may have heard of albinism (lacking the pigment melanin) or hypermelanism (an overabundance of the pigment melanin) for example. These naturally occurring conditions are rare, but can cause an individual of a specific species to look drastically different from a normal specimen of the same species. Below, we have included photos of all three species of U.S. Coral snake, that were found in the wild. Unless you are a trained snake expert, you could easily mistake one of these snakes as something other than what it is. This is yet another example of how that old adage could get you in trouble. In short, regardless of the red touches yellow saying, if you aren’t 100% sure what kind of snake you are looking at, do not attempt to touch it. Our last exception is an unfortunate little snake from the Southwest United States. Just when you think you have it all figured out, this little fella comes along and bucks the trend entirely! Red next to yellow kills a fellow, right? Not so in this instance. 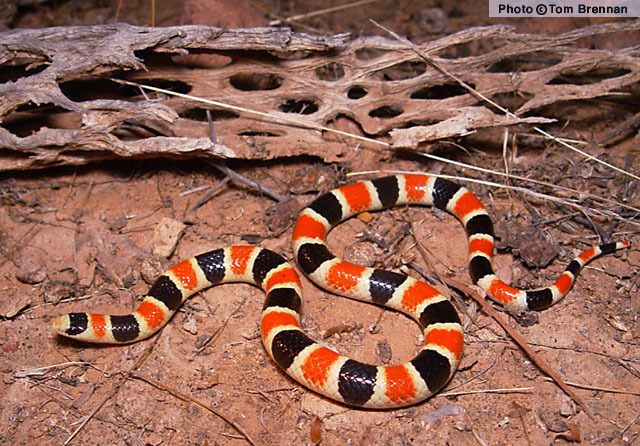 This harmless little Shovel-nosed snake from Arizona, is as close of a mimic as the Coral Snake has. However, if you look close, his head is not solid black, and the bands don’t actually go all the way around the belly. It’s an unfortunate reality that this harmless, docile, mild-mannered insect eater, is often a target of snake-fearing shovel wielders due to his similarity to his venomous cousin. If nothing else, we hope to have introduced you to some amazingly beautiful, if misunderstood animals. Hopefully it goes without saying, but it is always best never to touch, catch or kill any snake, unless you know precisely what it is. Even if you are able to identify a species as venomous, it is still very rarely the best option to decapitate the animal. Please be aware that all of these animals fill a very important role in our ecosystem and anytime we interfere with nature, as has been proven many times over, we only cause more harm than good. There is almost always an alternative to killing an animal, and it is one of our goals at Snakebuddies to conserve and protect these amazing creatures. If you have any questions, concerns or arguments, you are invited to leave a comment below, and we will surely get back to you. This entry was posted in Beautiful snakes, coral snake, Grey-banded Kingsnake, Ground Snake, harmless snakes, King Snake, Milk Snake, Mountian King Snake, non-venomous, Reptiles, Scarlet Kingsnake, Shovel-nose Snake, Snakes, venomous and tagged Antivenin, Antivenom, Coral snake, harmless snake, kill a fellow, king snake, Milk snakes, Rattlesnake, red and black is friend to jack, red and yellow, red and yellow kills a fellow, red and yellow saying, red and yellow snake, red touches yellow, Scarlet King Snake, Snake, Snake identification, Snakebite, Snakes, Sonoran Shovel-nose Snake, Southern Arizona, United States, Venom, Venomous snake. Bookmark the permalink. 72 Responses to Red and Yellow Kills a Fellow? Your Identification Guide to Tri-color snakes. As do I, Snake Care! I’m glad you enjoyed the post. I live in northern Mexico south of Arizona. We have a common snake which the people believe is a Coral Snake but appears more like your Sonoran shovel nose snake. They are killed on sight. This year there are many of these. It has a solid yellow head. No black band before the body starts. They are also cream-colored on the underside. They are also very skinny and a bit more pale than your pictures (beautiful). And they are definitely red on yellow. Other websites say Coral snakes have yellow heads as does our local snake. Chuck, I always hesitate to ID snakes outside of the U.S. (especially without a photo), but based on your description, I am convinced that you are correct in assuming the critters are a subspecies of Shovel Nosed snake. I’ve scanned through reputable sites describing Mexican Coral Snake species in your area, and they all have bands that continue all the way around the body and have black heads. If you have a picture, please post one. Or you can email it to me at jamisonhensley@gmail.com. For the time being, stay safe and enjoy them from a distance. I look forward to hearing back, and would love to help you solve the mystery, so that you can, in turn, teach others the benefits of these unique and beautiful snakes. Wow I learned a lot. Thank you. You are very welcome, snowyinLA! Thanks for visiting our blog. Arizona coral snakes are gorgeous! I think they’re my favorite too, though I don’t think i’ve seen one personally. Jamie, They are truly beautiful snakes, and for all practical purposes, pose VERY little threat to anyone unless picked up. Such laid back, docile little critters. It’s hard NOT to love them. 🙂 I saw my first one last Summer and cannot wait to find another. Thank you so much. I did learn a lot from this blog. I also think all of these are very beautiful snakes and can not wait to read some more. That was a great post and well researched. I live in North Georgia so we only have the milk snake here but in South Georgia the two snakes overlap so it is great to learn to correctly identify them. I discovered a Coral Snake in my garage today. I live in southwest Florida. It slithered out and went into a mulch covered area to the side of my garage. Now I am worried it is still around and may hurt someone in my family or my small dog or the gardeners. I am especially nervous because the article says the anti-venom is unavailable. Any thoughts or suggestions? Leslie, I do appreciate and understand your concern. However, please don’t lose too much sleep over this. I would not necessarily want a coral in my yard either, but the fact remains that unless you disturb the snake, you are extremely unlikely to bitten. You could try calling a snake removal company. There are quite a few in Florida. However, I would be surprised if you ever see the snake again. They try hard to avoid people and pets, so my guess is that it will move on. If you do seethe snake again, and can safely do so, you may consider quickly dispatching it with a shovel. I hats to suggest it, but I can’t fault you for killing a venomous snake that was in your garage. Feel free to let me know what you end up doing, or if you have any other questions. I have been terrified of snakes since I was a little girl and my brother would catch them and chase me around the house. Last night I found what I believe is a garter snake in my basement. I don’t want to kill it but I have to get it out of there. Right now it’s in an area that’s between an interior and exterior door. I closed off the door to the inside so it can’t get into the main area of the basement but I still need to get it out of there. I don’t want to kill it. Any suggestions on how to get it out? Also, I live in Massachusetts but I work all over the country and have encountered snakes in the southern states on several occasions. I try my best to stay away from them but sometimes you don’t see them until you’re on top of them. What’s the best thing to do to get out of that situation? I’m hoping that I’ll be less afraid of snakes if I understand them better. So sorry to hear that the little guy decided to invite himself in. I also travel a lot, and just checked my blog this morning. I apologize for being so slow to respond in your time of “crisis”. If you have a picture of the snake, I should be able to ID it for you. There are only two species of venomous snake in Massachusettes… the Timber Rattlesnake (easily identified by the rattle) and the Copperhead (broad triangular head, thick body, and hourglass bands down it’s body). Chances are good that your critter is completely harmless, and you can try a variety of ways to rid your home of it. Opening the exterior door, and gently “sweeping” him out with a broom, may be the easiest option. Other options, which will require you to get a little closer to the snake, would be to put a bucket or trash can (up-side-down) over the snake, and then slide a rigid piece of cardboard or poster board under the container. Then simply turn the container over. You can then transport the snake out of the house and relocate it further away from the home. A long handled butterfly net would likely also do the trick. Lastly, slipping on a pair of gloves and gently picking it up, and walking it out of the house would be simple and easy, but would require you to overcome your fear just a little. If handled gently, Garters rarely ever attempt to bite. If grabbed firmly, however, they will sometimes bite, and will almost always musk (excrete foul smelling liquid) in an attempt to get away. Help! I just moved to sw Florida & I am not at all used to snakes. We have a screened in pool but in the first 3 weeks here there has been a small black snake in my pool and a week later a coral snake swimming in it! 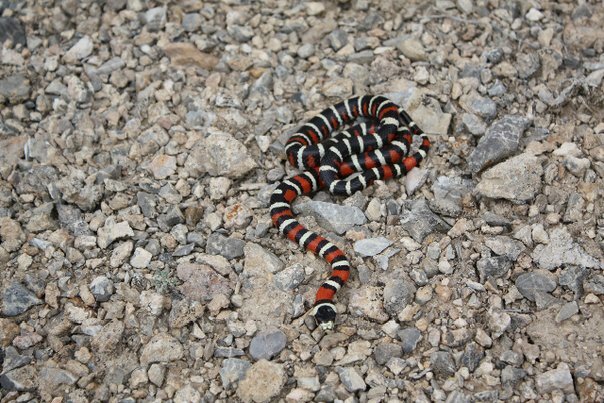 I was aware to be especially cautious of the brightly colored one & after looking at your pics, I definatley identified the coral snake. Now I am afraid to swim in the pool & even more so for my husband to be in the pool or yard. Years ago he had a kidney transplant & is on meds which make him immune supressed. Should I be extra worried? I scooped him out with the skimmer & at that time wasn’t sure if he was a coral so I didn’t kill it. Know that I know it was, i’m afraid of yhe yard and pool. Was told to use snake away or moth balls (flakes) around outside of pool. Does this work? Any other advice? Thanks! Oh Sharon… I’m the worst! How did I miss this comment?? I’m so sorry! I’m going to go out on a limb here, and guess that you haven’t seen the snake again, have you? Coral Snakes are so shy and cryptic, even people actively looking for them, can go years without finding one. Although venomous snakes are never to be taken lightly, I would absolutely discourage you from being “extra worried”. I would be shocked if there were more than a couple of Coral Snake bites on body parts other than the hand. They simply DO NOT attack. They “may” defend themselves, however, if picked up, or stepped on. If you live in Florida, you always want to be careful where you walk, and put your hands. The reality with a Coral Snake, is that you are better off leaving the snake alone, than you would be, if you try to catch or kill it. “Snake-away” and other treatments, are a waste of money in my opinion. Have heard strange anecdotal accounts that these tactics help, but I have seen absolutely no proof! Keeping your yard clear of debris (junk, old boards, dead brush, and pieces of tin Etc.) will be a much better approach than putting moth balls around your yard. Sorry again about my neglect in responding to you. Please forgive me, and let me know if there is anything more I can do to assist you. This is a great article. Thank you. I was doing some research for a program on venomous snakes and this will help me explain that the milk snake here in Colorado is completely harmless! Thank you again! Thanks for the feedback, Tiffany. I am glad that you found my article useful! Let me know if you need any additional information regarding your research paper. Though this rule does not apply in many states, In Colorado, all of your native snakes are perfectly harmless, unless they have a rattle on their tail. The other three venomous snake families in the U.S. (Copperhead, Water Moccasin, and Coral Snake) do not exist in Colorado. I have caught a few Milk Snakes in Colorado, and never tire of seeing them. Beautiful snakes, they are! Loved this article. Thank you. Breaks my heart when people choose to kill snakes when another option exists… education goes a long way to prevent this from happening. Well done! Thanks Yolande! I appreciate your comment. Tri-color snakes (harmless or venomous) are so extremely beautiful, and I simply can’t think of a logical reason to kill one. Coral Snakes simply don’t pose the threat that society gives them credit for. Look, but don’t touch, and your odds of getting bitten, are virtually nonexistent! Feel free to perpetuate that education, Yolande! These critters need advocates like you! Thanks so much for this amazing article. My 5 year old son is very much a serious snake enthusiast already and this was helpful in hs being able to identify some of the snakes in his books by sight. we are in Germany so we only have garter snakes here to my knowledge. I did have a couple up close encounters with rattlesnake in Az when i lived there but we never saw a couple a coral snake. We did see a gorgeous king snake and milk snake at the zoo in Berlin recently as well as a very large patron my son got to touch. Vielen Dank, Jessi! I lived in Germany for a couple of years, and never saw a snake, but there are a handful of them, native to Deutschland. The Grass Snake is fairly common, and the European Adder (venomous) can be found somewhat frequently in certain areas. You also have the Aesculapian Snake, Smooth Snake, Western Whip Snake, and Dice Snakes native to Germany. I’m glad that you and your son enjoyed my article. I have lots more that I hope you’ll find equally useful. I’ve found that children who receive education about snakes, grow up to not fear or hate them as adults. Thank you for helping your son have these experiences, and let me know if you have any questions. That would be python. Sorry about the T9 mistakes and double post. Stupid phone. The first post can be deleted. Hm. What a coincidence. I was looking for something completely else when I came across this blog. I live in Michigan (and have seen one Missisaugua rattler) and winter near Orlando Fl. Snakes are a common discussion subject in Florida, because most of the people near us are from “up north”. I must be lucky, I have had personal encounters with 2 coral snakes in the 14 years I have wintered there. Both encounters were called to my attention by someone else who was literally “running for his life”. The first was a true coral snake. It was only about 3 – 3 1/2 ft. long and very slender. It had been seen by a youngster, who chased it as it tried to make its exit. The park manager and I ran it down (not over) with a golf cart, picked it up with a shovel…no easy manuever…and deposited it in the nearby woods. The second one was when one of the maintenance ladies in our park burst into the office in total hysteria, screaming in Mexican…there’s a coral snake in the tree down near the rest room in the swimming pool area. This I really had to see. I have never heard that a coral snake had an inclination to climbing trees. One of the workers…an excellent shovel handler…and I went to see. Well, there was indeed a tri-banded snake on the lower limb of a tree near the pool. Of course the pool was completely emptied of humans after all of this. In the process of trying to knock a moving snake from a tree with a shovel I learned that to be much more difficult than imagineable. I really wanted to capture the dude, and if it wasn’t a coral I could at least ease some tensions around there. I held the ladder, the maintenance guy wielded the shovel and finally was able to knock it off the tree branch, but it vanished into a very thick swamp like area behind the bath house. I have said all that to say this: I sure do appreciate this article. It became very apparent when one is sure they are going to be charged and attacked by a vicious coral snake…it’s hard to remember the rhyme. I couldn’t remember it in either instance, I was too busy trying to be sure it was headed away from me. I cannot confirm the second one because all I could think of at the time was RED….DEAD…but I wasn’t sure if it was the snake or me that would be dead. Then I recalled the part about yellow having something to do with some fellow. But, I wasn’t sure what it had to do with, and it didn’t really matter at that time. I had totally forgotten about the black head. But the first one did in fact, have a black head. The second was too busy a scene to identify anything except the ladder, and the crowd of brave “experts” standing well clear of the tree. Finally, the ending, and the hope of learning something. Do coral snakes climb trees? It doesn’t seem possible, but…? And, secondly, thank you again for an excellent article. Easily understood, well documented, great photos, and written by an excellent author. 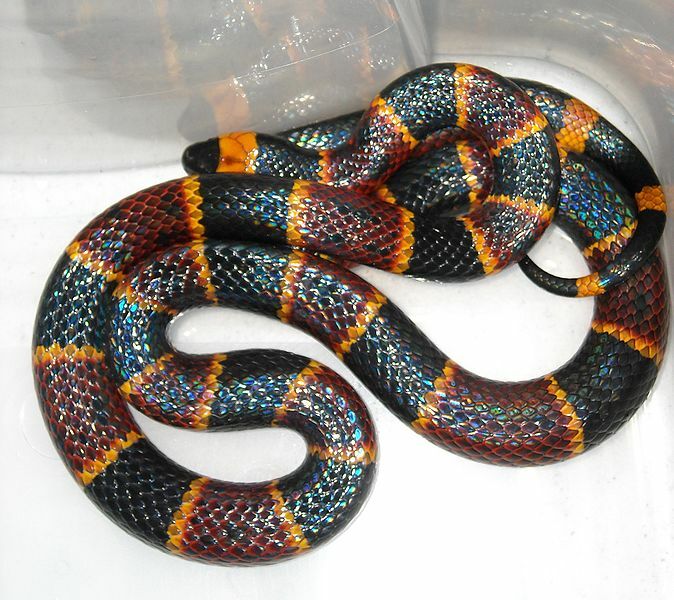 I have written my own coral snake rhyme, it’s easier to remember: “Any snake with a fancy paint job I fear. Pardon me, but I’m out of here.” Oh, one other thing: Do I need, or can I have permission to post a copy of this article on the community bulletin board (with credit of course)? People from the north seem to have a built in terror factor when it comes to any snake, and it increases in intensity as the size and reputation of the snake increases. I swear this to be true(ish): my neighbor watched as I removed to cover from the sprinkler control system, and down in the box, was a coiled up humongous snake. My neighbor was able to shriek a note never before reached by a male, and set a world record for the 100 yard dash….while running backward. It was a “coach whip”, and when I lifted it out of the box, it attacked ME. It was not a pleasant nor docile creature. I finally had to dispatch the ornrey S.O.B. it measured 6′ 10″ long, and I have photos of that one. But not of my neighbor, which would have been far more valuable than a picture of a dead snake. Thank you again, and the very best to you. Thank you for the kind words, and for sharing your great stories. I got a good chuckle out of them. I also appreciate your diligence in relocating even the venomous Coral snake. That’s fantastic! Coral snakes are not inherently known for climbing trees. They feed primarily on small ground-dwelling species, and a very shy as well, which is why they would be more likely found on the ground, in leaf litter, or under boards etc. Most snakes can climb some trees, but some snakes are much better at it than others. In Florida, your best Coral snake mimics would be the Scarlet King Snake, and the Scarlet Snake. Some Corn Snakes can also have a fairly tri-colored pattern, and they are fairly good at climbing trees. I would be inclined to think that your “tree snake” was one of these harmless critters, but it’s impossible to know without a photo. You are more than welcome to post my article anywhere you see fit. It’s all about education for me, and I appreciate your desire to spread the word. I’m glad you found my blog, even if it was by accident, and hope you make it back from time to time. Take good care, and keep using that shovel to save our scaly friends! Yes, Ian. That is indeed a Coral Snake. However, please note that the characteristics for North American Corals can be quite different from those in South America. The little rhyme we use in the U.S., will not always work in South America. Thanks for sharing the photo. What a beautiful snake. Found a tx coral snake today in Amarillo, tx. It is not on the map and I’ve never seen one here, but was positively identified as a coral. Please send me a picture. I’d love to see it. Hi. Great, well written article. Saw a Texas coral over the weekend near our well house in Georgetown, TX. Beautiful snake – didn’t get a picture but it left me alone and vice versa. Thanks for all the info. Great to hear, Pete. Glad you were able to experience such a beautiful animal in person, without feeling immediately threatened. Thanks for sharing the experience. This post saved the life of a texas coral snake this week. I caught it in my neighbor’s driveway after my 4 year old spotted it in west austin. We kept it in a jar overnight, then set it loose in the greenbelt the next day after reading this post and researching online. It was about 9 inches long, and more thin than my litle finger, with very bright colors, a beautiful snake. Awesome, Brad! I’m so glad that someone with your foresight and appreciation for nature, found the little snake. It is stories like these, that make all my efforts feel worthwhile. Thanks so much for sharing your awesome story. Great website! I wish all people felt this way about snakes. They are fascinating creatures. My husband grew up in Montana and hated all snakes. But, in the seventeen years we have been at our current address, he has come to appreciate them and no longer kills them! Thanks, Daniel! I’m glad you liked it. Snakes still give me a fright while taking our dog for a walk around our CO property, as we have rattlesnakes. Thanks to your great site & info, you saved what I now believe was a Milksnake that we found today on our land. Keep up the good work, as this little one was a beauty and now that I know it is ‘harmless’ it will live another day to do its part of keeping the ‘circle of life’ in balance. Much appreciated! That’s awesome news, 4cornersbabe. In Colorado, the only potentially harmful snakes have a rattle on their tail, so anything else is likely going to be a benefit to keep around. So glad you found our site, and thanks so much for sharing a great success story with us! I have a severe phobia of snakes & recently encountered one & I totally freaked. After doing some research I believe it was a corn snake & am beyond relieved to learn it’s harmless since it was outside my front door haha. I just finished reading your article & it was so informative, I know feel more comfortable especially when it comes to the tri colored snakes. Although I’m terrified of snakes I’d never want to harm one & especially when there’s no threat. I’m in south Florida and I’m told there are some that are poisonous & people have tried to explain & I’ve tried to do research but I always found it so confusing until your article! So thank you for making it so easy!!! I was wondering if you have more articles like this one to help me learn more about which ones are venomous? That’s fantastic, Lauren! Thanks for your kind words and for sharing your story with us! We have been spending a lot of time on some new projects and a new website, and have gotten a bit behind on articles, but we do still post content regularly on our Facebook page, that you may find interesting and informative. We also invite you to reach out, and ask any questions you have. Southern Florida is home to a handful of venomous species, but we are confident that your great attitude and desire to learn more will not only make you more comfortable around these animals, but also keep you safer. Just look us up on Facebook (snake buddies), and stay in touch. Thanks for supplying these beautiful pictures.Recently while yard cleaning at our mountain vacation home in Hot Springs National Par k k, Arkansas,wecame across several baby snakes ,some black some grey. One snake about 12 inches long was beautifully colored similar to what i thought might be a texas coral. I placed it inside a large plastic box until next day at which time took some phone camera pictures and released it where it was found .Have not had time as yet to enlarge pictures for proper identification.sure hope it is a coral,always wanted to see one! Nice! When you get those photos uploaded, we’d love to see them, and would be happy to help you with identifications. You can email them to us at jamisonhensley@gmail.com, or post the to our Facebook page “Snake Buddies”. Thanks for sharing your story! Very beautiful snake species also very docile. Out of the 40-50 that I have come across throughout my life I’ve only had 2 actually try to bite. I don’t suggest anyone handling them. I have the pleasure of running a relocation business where I live. I work with rattlers, cotton mouths and the occasional Texas Coral. I try and educate everyone I possibly can about he benefits of not killing these beautiful creatures! While walking our dog. It was beautiful. We live in Georgetown Texas and live on property that backs up to Corp of engineers property by Lake Georgetown. It was docile and just slithering across the creek bed bridge. Your site was helpful to me. As someone who has been involved in the captive breeding and venom collection of Coral snakes for many years, I would like to compliment you on this excellent and comprehensive article. The Coral snake, unfortunately, is highly misunderstood and subject to a number of myths. You have done an exceptional job of pointing out the differences between Corals and the many snakes that mimic them and for emphasizing that the normal rules of identification do not apply to those found outside of the U.S. Thank you, Larry. We appreciate the kind feedback – especially from someone with your background! I already know about the exceptions like the shovel-nosed snake and the Brazilian coral snake. 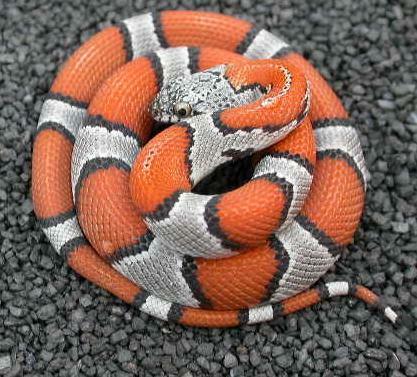 there is also a milk snake in Brazil that looks almost identical to the Brazilian coral snake. there are slight differences. I am glad more people are being taught about the exceptions so more people know. I’m an Admin in a Snake Identification group on Facebook, and I share this article pretty much anytime a tricolored snake is posted. It’s a great resource, and I’m grateful to be able to guide people here. I just thought I would mention that one of our members noticed an issue with one sentence. You say, “The red, yellow, and black bands go all the way around the body, as opposed to King and Milk snakes, which have banding that stops when it reaches the belly scales.” But as our group member pointed out, Scarlet King Snakes also have bands that go all the way around. It’s a minor issue in an otherwise very helpful article, but I thought it was worth bringing to your attention. I have always been a snake lover. My dad made sure of that, but I never did pick up the best habits from him.. ^^; I never did stop to look at the snakes I picked up. Garter snakes and grass snakes were easy to identify in the garden, but I had a nasty habit of picking up any snake the moment someone screamed “snake!!”. Reading your article (after getting a pueblan milksnake myself) I discovered the milk snake I held in the wild none too long ago, that made me want to get a milk snake, was actually a coral. I consider myself so extremely lucky I wasn’t bitten, and it taught me a valuble lesson to leave the wild be, and not to mess with animals I don’t understand. I really appreciate you making this, and I hope to be smarter in the future. I really like this very informative article. I’m one of the rare ones who isn’t bothered by snakes. If anything, I think they’re very beautiful creatures. I do know the difference between coral snakes and the mimics. But I would smile from ear to ear if I saw a coral snake in the wild. I think with a little education, people would learn to appreciate snakes rather than be afraid. Even the venomous ones. I’ve been almost leg to face with a copperhead and it never struck at me. That told me that even venomous snakes don’t want to confront humans unless it’s absolutely necessary. Thanks for the comment, Teddy. You are absolutely right. Snakes (venomous or not) have no intention of biting humans, unless there is no other option. Biting a human is a death sentence to a snake. as far back as i can remember, snakes with a “cats eye” were deemed poisonous. Is this not true today??? We hope that helps, and look forward to hearing from you, if you have any other snake-related questions. Any time, Nick! We are happy to help, and love it when people ask questions like yours. Thanks for visiting our blog, and best of luck with your “pet”. While it’s true that all vipers have elliptical pupils, some harmless colubrids, boas and pythons have these eyes as well. And most elapids, all of which are venomous, have round pupils. The only poisonous snake in the world is the Asian keelback, a rear-fanged colubrid (yes, it is also venomous; some species are medically significant). And it has round pupils. Today I placed a cardboard box over a baby snake who was hunting the baby anoles here on my porch. My son slid a pizza box cover under the bottom edge and brought the snake to the woods and let it go. We live in Central Florida on the east coast. I can’t tell if the baby snake was a baby pygmy rattle snake or a garder snake. It was dark greyish-black with a nice pattern of the same but slightly darker shade of greyish-black along it’s back… not lighter on the belly… very uniform in color. I did’t see a rattle but the snake was no more than 10-12 inches long and about the thickness of a pencil! Very cute but a menace to the anoles that we like and 4 baby anoles had just emerged from eggs over the last few days so…. the snake had to go. Can you tell from my description which it was? The head was a “diamond” shape; wider at the neck. I enjoyed your article about venomous snakes very much! Thanks for the comment. A photo would be ideal, since there are many snakes in Florida, and a handful that could fit your description. Even baby Pygmy Rattlesnakes are born with a button of a rattle, and they are usually a bit chubbier than what you referenced. It could be anything from a young Black Rat snake, a Black racer (uniform in color), or possibly one of several Water snake species you have there. Sorry we can’t be more specific, but chances are it was a harmless snake…unless you’re an Anole. Haha! Good job relocating the little guy! Thanks again! That is true. Venomous snakes have catlike eyes and most have triangular heads except coral snakes and boomslangs. I sure would never kill a snake (or any creature for that matter). Thanks for clearing up a confusing theory about red on yellow. Very very informative. What is the difference between antivenin and antivenom? 🐍 Very cool.